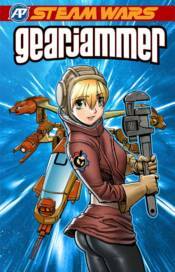 Blasting off the pages of Steam Wars: First Empire comes the pulse-pounding adventures of top pilot Zora Gearjammer! Downed by an enemy ace, Zora survives to find the legendary Star Ember, which can power any known device. Now she must race against time with it to prevent her emperor's execution and unite an Empire on the verge of civil war. The enemy has a plan - and she's the kink.